Nicaragua is a country in Central America boasting with unparalleled natural beauty featuring conical-shaped volcanos, pretty colonial cities, deeply carved canyons, stunning beaches on both, Carribean and Pacific side of the country and much more. 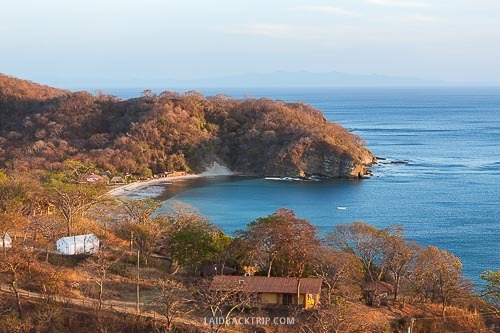 Under normal circumstances, budget-friendly Nicaragua would have been on travelers' radar, but sadly, recent events (protests against government accompanied by violence outbreaks) slowed down progress and tourism in the whole country. The situation was the worst last year in April (2018), and since then the atmosphere in the society has slightly improved, but protests still can occur from time to time. We would like to inspire you to visit Nicaragua, as this beautiful country surely deserves its place in the sun, but you still should watch the news and be ready to change your travel plans in case the new wave of demonstrations come. San Juan del Sur is a lovely town on the Pacific side of Nicaragua which offers a dazzling choice of things to do for travelers on a various budget with various interests. The atmosphere and life in the town are at the moment quieter and slower than it had been year or two ago, but we wouldn't have thought of it as about a disadvantage. Read our ultimate guide on the best things to do while in San Juan del Sur to get the most out of your visit. Our favorite activity every day was to sit down around 5:30 on a sundeck in our hotel and wait for the spectacular sunset. Our expectations were high as we had seen pictures from Hush Maderas before our arrival, but the sundown never failed and was each night unique but equally beautiful. Another place from where you can watch the sunset is on one of many beaches close to San Juan del Sur or if you prefer the bird-eye view, head to the Christ statue. The official closing time is at 6 PM, but no one will kick you out if you want to stay longer and watch the sky turning to different shades of red. Nicaragua has many other natural and cultural highlights you can visit, and we were surprised how many people decide to travel to nearby Ometepe (volcano views) or Granada (colonial city) on one day trip from San Juan del Sur. We had enough time, so we wanted to go to each destination separately for a couple more days, but if your time is limited, and you don't want move from place to place and constantly pack and unpack your suitcase, you can reserve a seat in the shuttle bus from San Juan del Sur. It is more expensive than taking public transport, but it would have been a long day spent on the bus instead of enjoying your day trip, so we consider it a wise solution. The main reason to visit San Juan del Sur is, of course, beaches. You can find your favorite one and stick to it until the end of your stay, or you can visit a new place every day, it is up to your mood and travel style. The most popular beaches are a short drive from the town - Playa Maderas, Playa Hermosa or Playa Remanso. If you are staying in the town without a rental car, your best bet is using a shuttle serving all three beaches provided by Casa Oro Hotel. Maderas Beach | Shuttle goes four times a day and cost $5 for roundtrip or $3 for a one-way ride. Times are as follows: 10 AM, 12:30 PM, 2:30 PM and 5 PM from San Juan del Sur and returning from Maderas Beach at 10:45 AM, 1:15 PM, 3:15 PM and 5:30 PM. If you are staying in Hush Maderas, ask the hotel's staff to call the driver to pick you up as the shuttle doesn't drive around the hotel (at no additional cost). Remanso Beach | The shuttle to Remanso Beach cost $5 per person and runs only once a day. It leaves at 11:30 AM from San Juan del Sur and returns at 4:30 PM. Hermosa Beach | Playa Hermosa is a privately owned beach, but the shuttle cost $8 and already includes the entrance fee. It leaves San Juan del Sur at 11:30 AM and returns at 4:00 PM. Other Beaches | There are also other world-class beaches near San Juan del Sur such as El Coco served by a shuttle as well, but it requires a minimum of four people, but you can set your own time. Public Transport | Infrequent public buses also serve beaches near San Juan del Sur leaving from the bus stop opposite towns market. One ride usually cost $1, but the schedule can change, and in this case, we think that booking the shuttle is a more comfortable and quicker option on how to get on the beach. The food we had in this coastal town of Nicaragua was so far the best we've tasted in Central America. We ate mostly in our hotel Hush Maderas, and couldn't get enough of their freshly made burritos, but we were also happy with tacos we tried in San Juan del Sur in Taco Spot (but there are other Mexican restaurants with similar prices and quality) or at the market. If you want to eat traditional Nicaraguan food, you should try Gallo Pinto. It is a national dish made of red beans, white rice with onions, and we usually got eggs (scrambled or fried), avocado and bite of cheese on top of that. Locals eat this meal at least once a day, and it does not matter if it is breakfast, lunch or dinner time. Like Rio has Christ the Redeemer overlooking the city, San Juan del Sur has Christ of the Mercy alias Mirador del Cristo de la Misericordia guarding the town and San Juan del Sur bay. It can sound unfair to compare the view with one of the world's most famous vistas (although it is nice), but the Christ of the Mercy is unquestionably worth mentioning as with 25 meters belongs among the world's highest statues. The views from the top are absolutely splendid as the bay has the perfect photogenic U-shape. You must pay an entrance fee which is $2 (C$60) for foreigners or $1 for locals. It is easy to find the way on the top of the hill, only follow the road leading out of the town in the direction to the statue, you cannot get lost. The walk takes about 15 minutes, but you can also drive or take a taxi all the way up in case you feel tired. The welcoming weather from December to April makes from San Juan del Sur a perfect destination for a vacation. This is Nicaraguan summer and dry season, so rain is very unlikely, it is hot, but not uncomfortably hot because of blowing winds. At this time of the year, it is easy to forget all your troubles, lie down on a beach with a book in hand and relax. The dry season coincides with winter time in the USA, Canada or Europe, and San Juan del Sur aspires to be that heavenly gateway for travelers looking for a peaceful yet affordable place to enjoy the exotic holiday. The rainy season runs from May to November, but it doesn't rain nonstop for days, you will rather experience short afternoon showers, so you can plan on visiting San Juan del Sur all year round. Surfing is another favorite thing to do in San Juan del Sur. It is a place where experienced surfers arrive to enjoy waves, but it is also a great spot for beginners as there are many schools where you can learn how to surf for a bargain. One lesson costs around $25. We visited the town in the high, summer season, and saw quite a lot surfers conquering the waves, but you won't make a mistake when you arrive here is the rainy season which also brings high southern swell picking up from March over the next few months. We feel like our party days are over, but we cannot miss mentioning one of the biggest parties in the area taking place in San Juan del Sur every Sunday which draw young international travelers as a magnet to this town. This weekly pool crawl is very popular, although we don't get why: we are probably not in the right age anymore, but more likely we've never been in the stage of our life when we spent $30 just to get transport from one pub to another, entrance to five clubs and a free t-shirt. You must pay for drinks on top of that. For us, coming from the Czech Republic, it is a lot of money, and this amount was usually what we spent in our twenties together when going for a drink on weekends. If you stay in one of the participating hotels, either Pachamama hotel (where it starts), or Naked Tiger (where it ends), you will get a discounted ticket for $15. If you feel like you could enjoy a drink or two, we recommend you to head to Hush Maderas hotel which hosts Margarita Monday every week. It is a great occasion to enjoy a superb drink, and get in touch with same-minded travelers. San Juan del Sur is a lovely beach town lined with pretty colorful houses, many bars, restaurants (on Monday they looked somehow empty) and hotels. It is worth it to walk around and snap some pictures before you hit the beach. We recommend you to visit the local market - it is a good place for cheap shopping (Martin's flipflops ripped when we walked to the viewpoint, so we had to quickly find a store to replace them), there are also several local and affordable restaurants and excellent fruit stalls. Does galloping on a horse on an empty sandy beach during sunset or sunrise sound appealing for you? For us definitely yes, but since Martin hurt his back when we did horseback riding in San Agustin in Colombia, and hasn't fully recovered yet (although it happened several months back), we did not want to take our chances. If you are interested in this activity, you can contact for example Rancho Chilamate. We must admit that sailing in San Juan del Sur was a bit out of our budget, but if the sea is calling you, you can take a tour and take advantage of Nicaragua’s offshore winds. This full-day tour will set you back about $120, but it must be amazing. When arriving in San Juan del Sur, you have two options on where to stay. You can look for accommodation right in the town, or you can find a place to stay closer to pristine beaches. We chose the latter one and stayed just a stone's throw from SJdS' gem, Maderas Beach in Hush Maderas. We arrived at Hush Maderas hotel after a somewhat long day. We woke up before 6 AM in Bijagua, Costa Rica because we needed to catch a bus to Liberia and then another one to Nicaraguan borders, where we had a chance to see a time-wasting bureaucracy first-hand, and then we had to take another three buses before we got to our final destination. You can probably imagine that we felt quite exhausted and dusty after this journey, but all our tiredness and anxiety from a challenging day melted away immediately once we entered our home for the next four days, Hush Maderas. 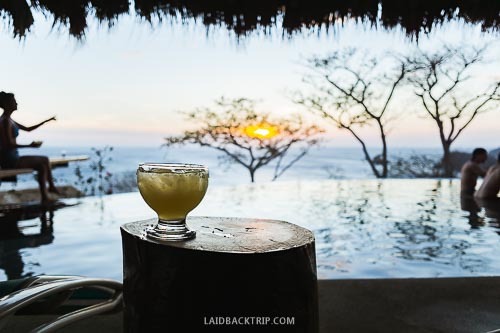 The views were splendid, and before we knew it, we were checked in with refreshing drinks in hands, sitting on a wooden terrace overlooking the infinity pool. About Hush Maderas Hotel | The boutique hotel is run by a Britain-Dutch couple, Tobias and Sanne, who do their best to make sure that each guest will feel relaxed and stress-free in their secret spot in paradise, and we must say that they do it well. You can always see when people have a personal interest in the business and when the job is their hobby as well. The atmosphere is different, there is no rush, the staff is willing to help with any question you might have, and more importantly, they have time to do so. Location | Hush Maderas Hotel is located only 15 minutes drive from San Juan del Sur in a peaceful neighborhood of Maderas beach, the most beautiful beach and the best surfing spot in the area. This place is for everyone who wants to reconnect with nature and with each other, but you don't need to worry that you will be completely cut off from the outside world unless you desire to. If you don't have a car like us, you can easily get to the town of San Juan del Sur by taxi ($8) or by one of four daily shuttles for $3 per person. Hadn't we had this blog which forces us to visit a place or two, so we can share our experiences with you guys, we must admit we wouldn't have many reasons to leave the hotel. Philosophy & Sustainability | The extraordinary settings of this hotel call for sustainable solutions, so you shouldn't be surprised that the hotel's management takes seriously our negative impact on the planet Earth and tries to reduce it in all ways possible. Hush Maderas practices 100% solar efficiency and water conservation, and also works to keep the unrecyclable waste on minimum. Also, over-usage of plastic is an issue anywhere in the world, but it can be an absolute disaster in less developed parts of the planet because not only people are still not used to think of it as about a problem, but they also often don't know what to do with plastic or don't have sources to deal with it. Hush Maderas makes an effort to recycle all plastic, glass and organic waste to make the life in San Juan del Sur better. Another action worth mentioning is the project, that sets itself a goal of helping the local community by building houses for impoverished inhabitants or by increasing the standard of education for local kids. When looking for a hotel, we think you could and should take into account all those activities because by staying here you don't only reward yourself, but also help indirectly support the local community. Rooms | Rooms in Hush Maderas are spacious with high ceilings and large windows, and we are probably doing them a disservice by using this word. You must come and see it with your very own eyes - they are huge. There are several private and reasonably-priced rooms with king or queen beds which can fit up to four people, but there is also one dorm room which can sleep up to five people. We think it is great that solo travelers or people traveling on a lower budget can still enjoy such a beautiful and secluded place without breaking the bank! Rooms in this hotel are decorated in a rustic-modern style - you won't find here many unnecessary add-ons, and thanks to it you will fully appreciate the unique space made by concrete, wood and naked walls. Pool | The infinity pool at Hush Maderas is a chapter on its own. It is an absolute gem, and it was as great as it looks on our pictures - maybe even slightly better. The pool was the real refreshing treat from where we could enjoy views over the ocean and watch incredible sunsets every evening. There is only one disadvantage when you have a pool like this in your hotel - you don't want to go far away for long. Margarita Mondays & Yoga | The hotel hosts a notable social event called Margarita Mondays. Obviously, it happens every Monday, and everyone can come and join - guests or anyone passing by. This event is well-known in San Juan del Sur and the surroundings, and we were quite surprised (positively) how lively the hotel and the bar was on Monday in comparison with other, much quieter nights. Even when you found the accommodation elsewhere, it would be a shame not to taste delicious margarita and tacos for only $5. Apart from socializing with guests, another passion of the couple running Hush Maderas is yoga. 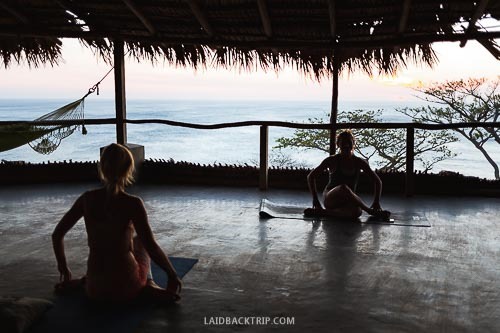 It might be surprising to find a yoga gateway in Nicaragua - it is probably something you would have expected rather in Southeast Asia, but once you will see the perfect settings, you will find out that the yoga classes fit here perfectly. One hour-long lesson cost $6, and again, everyone can join, stretch the body and de-stress. Apart from yoga, you can also ask for a traditional Thai massage! Food | Very good breakfast is included in the room price (every day breakfast is a bit different than the day before), but the kitchen also makes exceptional snacks, lunch or dinner. The price range of food is between $4 to $7, and you will get a portion of great food for what you pay. You can, of course, go to San Juan del Sur or try one of many restaurants along beaches, but honestly, after we'd had our first meal in Hush Maderas, we did not have a reason to go and try somewhere else. Every meal is freshly-made, and you can choose from a selection of local and international dishes. Common areas | It is warm outside, but not uncomfortably hot, so we enjoyed spending our time mostly in front of our room. We had a restaurant right next to our door and the sitting area close as well when we wanted to hang out on fresh air or when we needed to catch up with work. The main relaxing zone is around the pool, but if you are seeking for even more quiet experience, there is another sitting area on the second floor with hanging hammocks on a terrace where you can read, think, or do nothing at all. Sanne is a yoga instructor, so this is also a place where yoga classes take place. To enjoy this extraordinary hotel, you must do only two things. Book a flight ticket to Nicaragua and make your reservation. No matter where are you coming from, you will most likely end up in the city of Rivas, Nicaraguan transport hub near borders with Costa Rica. From Rivas, take a bus leaving from the bus terminal every 30 minutes directly to San Juan del Sur. The ride takes approximately 45 minutes and costs $1.5. In Nicaragua, it can happen to you that the conductor will want to charge you for your luggage about the same price you pay for the seat, even when you store it on the roof - we refused to pay the fee, as it seemed as a shady practice. San Juan del Sur is a safe town, most of the people realize, that tourists come and bring money only when they feel safe in the area. That being said, you still should not walk on beaches after dark, especially alone, and you should not also go at all (or ask locals about the current situation) to William Walker Fortress and The Lighthouse where recently robbings at machete-point occurred. This post was written in collaboration with Hush Maderas Hotel. As always, all opinions are our own.